PABLO WIN TfL COMPETITION FOR HOLLAND AND BARRETT WITH ME.NO.PAUSE. 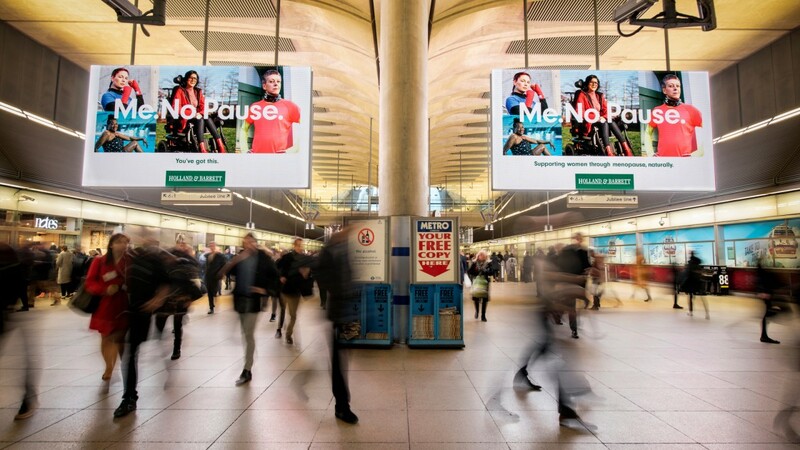 "Me.No.Pause" has been chosen as the winner of ‘The Women We See’ competition launched by City Hall and TfL, and will be displayed to passengers across TfL’s network. The campaign - selected from over 80 submissions - was chosen for its commitment to featuring all types of women on a national stage, to surface an issue that has previously been viewed as a taboo among both advertisers and the general public, and celebrates women who defy the menopause, however tough it can be. The competition gave brands the opportunity to win £500,000-worth of prominent advertising space across the TfL network – one of the biggest advertising estates in the world, seen by people on the 31 million journeys taken on TfL’s network every day. The outdoor campaign will be supported by an integrated marketing campaign that includes PR, social, digital, content and in-store, as well as press and a film which will be live on 9th February 2019 and voiced by English actress Sally Phillips, with staff in Holland & Barrett stores nationwide trained to advise on the physical and emotional impact of the menopause.